This afternoon I was privileged to spend an hour at the Dragon Cafe (http://dragoncafe.co.uk) with Norman Lamb MP, Lib Dem Minister of State for Care and Support. What a lovely man, and how patient he was with all the people he met – listening carefully to their thoughts and ideas. 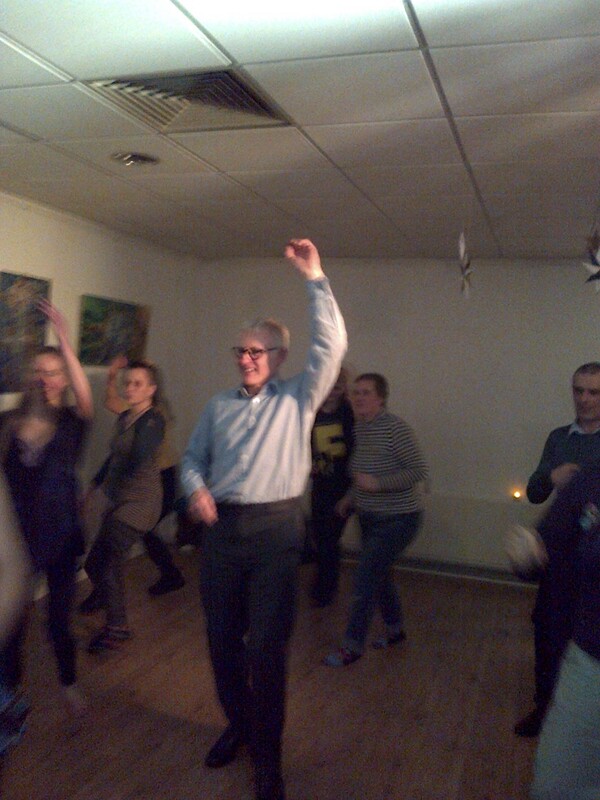 Here he is, joining in with a dance session! It was clear from the conversations taking place that the Dragon Cafe offers quite a unique service to those who are dealing with the effects or after effects of mental health issues – and thanks are largely due to the dedicated staff and volunteers who make sure that everyone feels comfortable with their surroundings. And it was very clear how important this community-led service is to those who use it. I hope that Norman is able to help this organisation to secure some long term funding, and that he feeds back some of the very real concerns that were raised around the treatment of mental health patients in some of the country’s institutions. Rather suspicious of politicians however from Sarah’s report Norman Lamb may yet be a good egg.